Have you noticed spots on your home’s roof that may look a bit off color or not exactly right? Many times a storm or high winds can damage your roof even if you haven’t noticed a roof leak yet. If your home’s roof looks as if it may have damage getting a roofing contractor in Gregory Michigan to inspect and make any roof repairs is needed for people who live in Gregory or surrounding areas. At Livingston Roof Pros we can provide a professional roof inspection to determine if your home needs roof repairs and if so, we can provide roofing services to help protect your home from weather. We are a fully qualified roofing contractor in Gregory Michigan and we offer free roofing estimates as well. The roof on your home is constantly being bombarded by weather events and debris from trees and such. Making sure it’s in good working order is important and when there is a problem calling Livingston Roof Pros can certainly help. We offer professional roofing services in Gregory Michigan and service all the major roofing types and materials that are located in southeastern Michigan. We’ve been in business installing and repairing roofing for many years and can provide you with the roofing services you need. There are many roofing companies that operate in our area that are not properly licensed and insured. While these places can offer cut rate and extremely low prices they usually come at a cost that many buyers aren’t aware of. Having a roofer in Gregory Michigan install your roofing that isn’t properly qualified can void the warranty on your entire roof. So even if they promised a 20 or 40 year warranty on the materials chances are it won’t be honored from the manufacturer. Roofing material manufacturers require the materials to be installed properly and according to guidelines set forth by them. Having qualified roofing contractor that is properly licensed and qualified to install your roofing materials is a must if you want to retain the warranty from the manufacturer. Even on roof repairs there are guidelines that must be followed so you can have all sorts of problems when you don’t use a properly licensed and insured roofing contractor in Gregory Michigan. 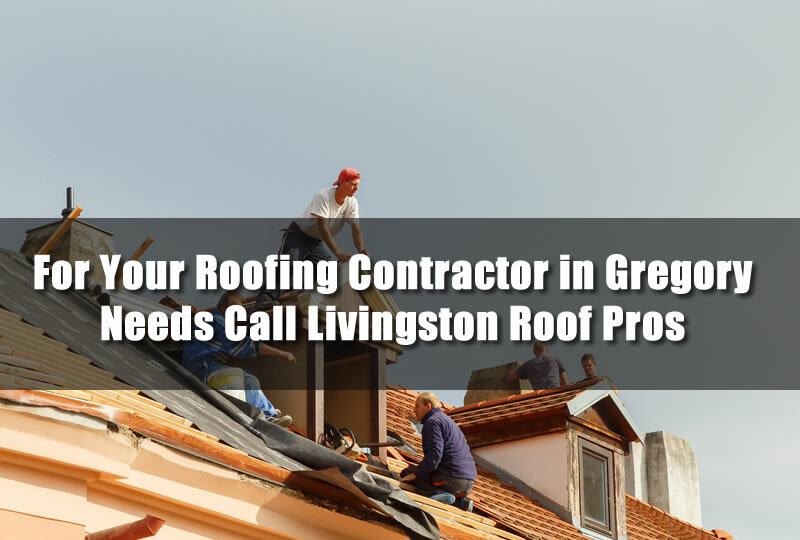 At Livingston Roof Pros we are fully licensed and insured to work on residential homes in the Gregory Michigan area. We have been part of this community for decades and we aren’t going anywhere. We’re not a fly by night company that wants to make a quick buck. We are dedicated and take pride in each and every roofing project we complete. From a small roof repair to a full new roof installation we stand behind every project we complete. We can do this because we do the job right the first time without cutting corners and discussing with the home owners exactly what they want and then deliver that. It’s a simple way we do business and how we’ve done business for many years. So if you hire Livingston Roof Pros to work on your home’s roof, rest assured we’ll make sure it’s done correctly the first time. If you’ve noticed places on your home’s roof that look as if it may be damaged in some way then be sure to call Livingston Roof Pros to get a roof inspection. We’ll have a fully qualified roofing expert inspect your roof for damages and potential problems. Being able to catch and repair roof problems early can really help to minimize or even prevent damages to the interior of your home. Even if you don’t notice any problems it is a good idea to have a roofing inspection done annually on your home to protect it from any problems. Want to learn more about the roofing services that Livingston Roof Pros offers and find out more about the cost of roof repairs or installing a new roof on your home? Call Livingston Roof Pros today to get a free estimate on your roofing needs in Gregory Michigan.